SEATTLE, Nov. 15, 2017 /PRNewswire/ -- Alaska Airlines today announced it will add nonstop, daily service between Seattle and Pittsburgh next fall. This new service is currently the only nonstop flight offered from Seattle-Tacoma International Airport to Pittsburgh International Airport. The new route provides a link from the West Coast to the thriving business community in Pittsburgh, which is continuing to grow as more technology companies look to establish a presence in the city. "Alaska continues to meet the needs of valued Seattle guests with new service to the Steel City," said John Kirby, vice president of capacity planning at Alaska Airlines. 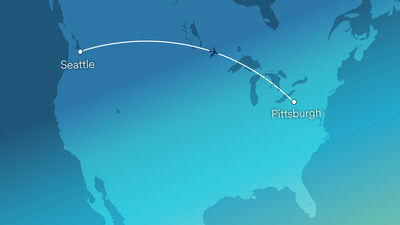 "We're pleased to add Pittsburgh to our growing list of destinations from our hometown of Seattle. With the addition of Pittsburgh, Alaska flies nonstop to 90 destinations, which is more than twice as many as any other airline." "The Pittsburgh region has been asking for additional service to the West Coast since I became County Executive, and we're thrilled to welcome Alaska Airlines," Allegheny County Executive Rich Fitzgerald said. "Nonstop service to Seattle will provide a critical link for businesses throughout Western Pennsylvania, as well as leisure travelers seeking new options." "This is a major win for our region, for both passengers and businesses," said Christina Cassotis, CEO at the Allegheny County Airport Authority. "Increased service to the West Coast has been a top priority and we are thrilled to add year-round, daily nonstop service to Seattle as part of our growing portfolio. Pittsburgh's burgeoning economy has strong ties throughout the West Coast making Alaska Airlines a natural fit." Tickets go on sale today. To purchase tickets, visit www.alaskaair.com or call 1-800-ALASKAAIR (800-252-7522 for Hearing & Speech Impaired (TTY): Dial 711 for Relay Services).